Postage of ceramic knobs costs just £1.75 for the 1st knob + 30p per additional knob. 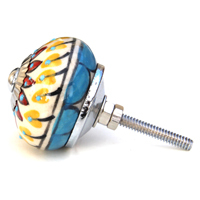 A beautiful rainbow of ceramic door knobs! Which will you choose? We'd love to keep in touch with you to let you know all about the latest trends and accessories, as well as our promotions. Born out of the revival of shabby chic and vintage fashions that sweeping the nation, a real trend is emerging for non matching door and draw handles and I am loving it! We accept all major payment methods at our secure checkout.